"The Social Security Board of Trustees today released its annual report on the long-term financial status of the Social Security Trust Funds. The combined asset reserves of the Old-Age and Survivors Insurance, and Disability Insurance (OASDI) Trust Funds are projected to become depleted in 2034, the same as projected last year, with 77 percent of benefits payable at that time." -- 7/13/2017 - Social Security Trustees Report. As mentioned in the quote above from the recently released Social Security Trustees Report, the "trust funds" will be depleted in 2034. That is the year I (Bill) turn 66 - one year prior to my full retirement age!!! I am not the only one concerned about maximizing my future Social Security benefits. Those considering retiring ask questions such as, "How will my early retirement impact my future Social Security benefits?" or "If I work longer, will that boost my benefit?" When answering these questions, the most important thing to understand is that your Social Security benefit is based upon your highest 35 years of earnings history (these years do not have to be consecutive). These earnings only include earnings UP TO the Social Security tax limit (currently $127,200) because earnings above this figure are irrelevant to the calculation of your benefits. This Social Security earnings history is then adjusted to today's dollars via the application of the Social Security "wage indexing factors". This is best understood with a visual example. Below is a hypothetical worker's 40 years of earnings. Naturally, since it is not inflation adjusted, the highest earnings will generally be more recent due to the effect of inflation. 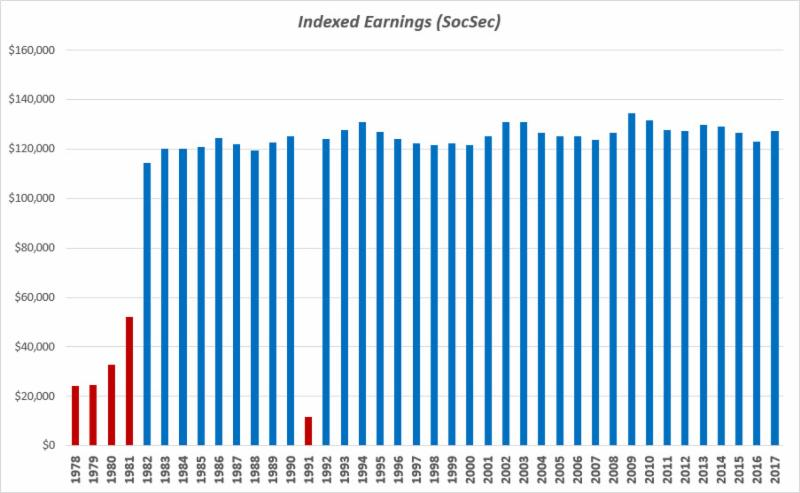 Below, the same earnings history is adjusted using the Social Security wage indexing factors to show the earnings history in today's dollars. It makes sense to inflation adjust past earnings in order to avoid penalizing benefit calculations as a result of inflation. Of these 40 years, Social Security only considers the highest 35 years (represented by the blue bars). Therefore, the remaining five years (red bars) are ignored in the calculation of benefits. So, will working an additional year increase this worker's Social Security benefit? The lowest income year of the 35 years occurred in 1997 with indexed income of $44,000. Therefore, if you can earn more than $44,000 by working an additional year, the new wage will replace the $44,000 wage used in the calculation of your Social Security benefits. Obviously the higher the wage (up to $127,200) the better. However, let's say a client does not have 35 years of Social Security earnings history. They only worked for 30 years. Naturally, any additional years of income will be valuable as it will be replacing a $0 earnings year in the calculation. Most clients have 35+ years of strong earnings history with almost all years at or above the maximum earnings level used in the calculation of benefits. 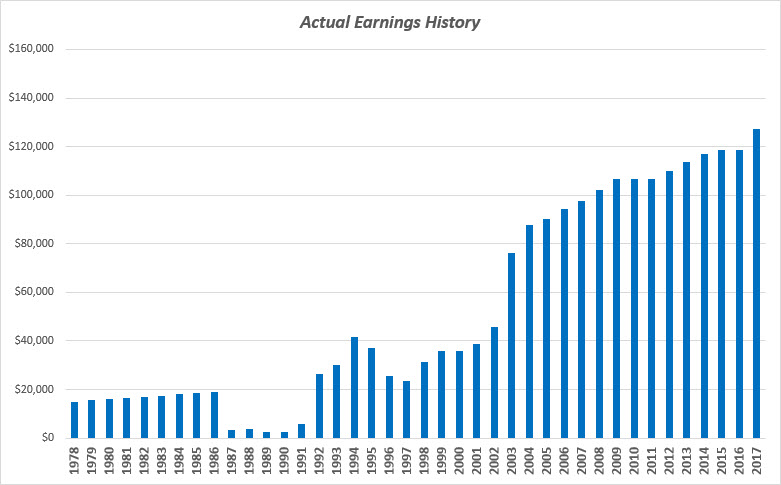 The picture below illustrates a 40 year indexed earnings history, with 35 years (blue bars) at the maximum earnings level. If this client is retiring and considering working for another year earning $50,000 (doing part time consulting) in order to boost their Social Security benefit, it won't help. This is because they already have 35 years of inflation adjusted maximum Social Security earnings of about $125,000/year. Instead, what if they get a job earning $125,000/year (or more)? This will still not impact their Social Security benefits since this year of income will merely replace a prior year that is about the same as the anticipated salary of $125,000. 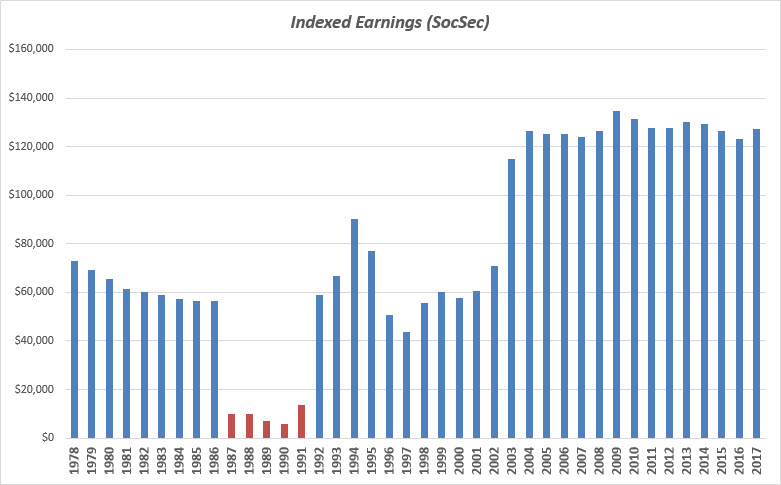 The impact on Social Security benefits of working additional years (or retiring early) depends on whether you have 35 years of earnings history, and what the overall indexed earnings have been. Most of our clients have long and strong earnings histories. Therefore, additional employment income will have little impact on future Social Security benefits. They are not adding additional higher income years to the 35 year formula. For the same reason, electing not to work additional years (i.e., retiring) does not harm their projected benefit since the 35 years have already been fulfilled with top earnings. Finally, in a related topic, it is also important to understand that the benefit shown on your Social Security statement is likely NOT ACCURATE. This is because it makes two assumptions that must be questioned. The first assumes you continue to work until your full retirement age (e.g., 67). The second assumes that while you continue to work, that you also continue to earn what you have been earning in the recent past. This may or may not have a big impact on the difference between what is shown on the statement and what you will actually receive. Therefore, it is always best to use a calculator (such as the following) to obtain the best estimate of your future benefits where you can enter your past and future income to obtain the most accurate estimate. These points above are simple, yet misunderstood concepts when it comes to Social Security planning. At Mallard, we understand these concepts and can evaluate the impact on Social Security as a result of working longer or retiring early. We also have the tools to evaluate all of the collection strategies available.